This apple was discovered in Washington, NJ before 1800. 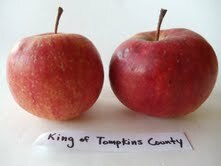 Also called King, or Tompkins King it first gained popularity in New York’s Tompkins County and in the 19th century was planted all over the Northeast in both backyards and commercial orchards. Old trees are still found here and there in Maine. In the Fedco Trees catalog, John recommends KTC for those who require sweet eating right off the tree or large juicy fruit to fill the sauce pot or the home cider press. Even the experts and apple snobs never pass up King in October. They’re good; they’re big; and the tree is productive. The lumpy, yellow fruit is almost entirely overlaid with dark orange-red stripes and blush. The tender yellow flesh has an excellent balanced flavor - not overly weird or spicy, just nice on the taste buds. Keeps until January.